Written by Yannick Gaultier on 29 February 2016 . 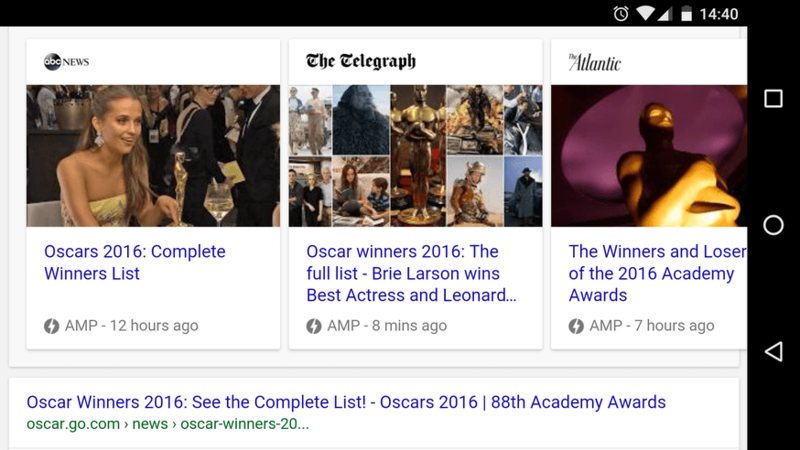 Accelerated Mobile Pages are now showing on many occasions in Google mobile search results, and are really delivering on instantly displaying web pages. Not only that, but as can be seen on the above screenshot, they take a very prominent spot in the search results. As outlined by some, even if AMP is not a ranking factor yet, simply being one of the results on this cards is enough to justify going AMP! And did I say those pages display instantly! And so, after last week release of the Community edition of wbAMP, I am pleased today to announce the availability of wbAMP full edition. The wbAMP section on our documentation center covers both Getting started with wbAMP, and the more advanced topics. You can use it for both editions. Finally, thanks to a great team of translators, wbAMP is already available in English, French, Russian, Spanish and very soon Dutch, Portuguese and Italian. Like all our GPL licensed extensions, wbAMP is now available through a yearly subscription, including updates and support, at a cost of $44 per year. We are aware the Accelerated Mobile Pages specification is still evolving, Google adding features even after the February 24 kickoff, but we will try to catch-up as much as possible, at least when it makes sense, and integrate all elements that can be beneficial to Joomla! sites in subsequent updates.